Another cast of local celebrities is assembling to participate in Dancing with Our Stars 2014 for the American Red Cross of Northeast Wisconsin, presented by the Schneider National Foundation. The star dancers will compete to raise the most money and take home the coveted Fundraising Mirror Ball Trophy. This year’s dancers will be revealed during a private kickoff party Tuesday, October 1st. Presented by Festival Foods, the kickoff party will be held at The Marq on French Road in De Pere. Dancing with Our Stars is now in its sixth year and it is has been a sold-out event each year. Not only do those in attendance support local efforts, so can those not attending as the star dancers receive votes in the form of donations to the Red Cross. One dollar equals one vote. All funds raised support disaster prevention, preparation and relief, the life-saving training of first aid, CPR/AED classes, collection and testing of blood and blood products, support to military members serving around the globe, the transportation program and international programs. Last year’s event raised nearly $370,000 for the local Red Cross. Betina Driver, wife of former Green Bay Packers wide receiver Donald Driver, took home the Fundraising Mirror Ball Trophy after raising $158,000. 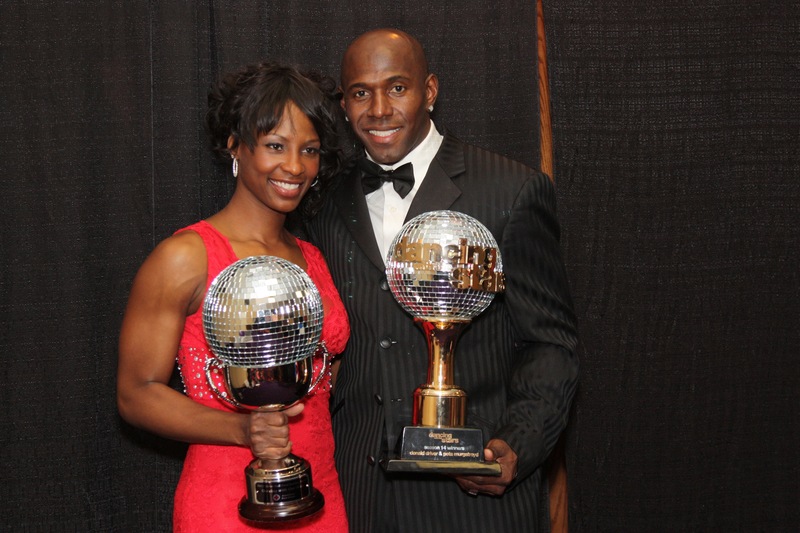 Betina Driver, and her husband and dancer partner Donald Driver, showing off their matching mirrorball trophies. The Schneider National Foundation, Arketype, Associated Bank, Bay Industries, Festival Foods, Green Bay Packaging, Inc., Green Bay Packers, Jack’s Maintenance, WBAY-TV, WIXX and the Green Bay Press-Gazette are proud sponsors of Dancing with our Stars 2014. « Who would you like to see dance next??? ?